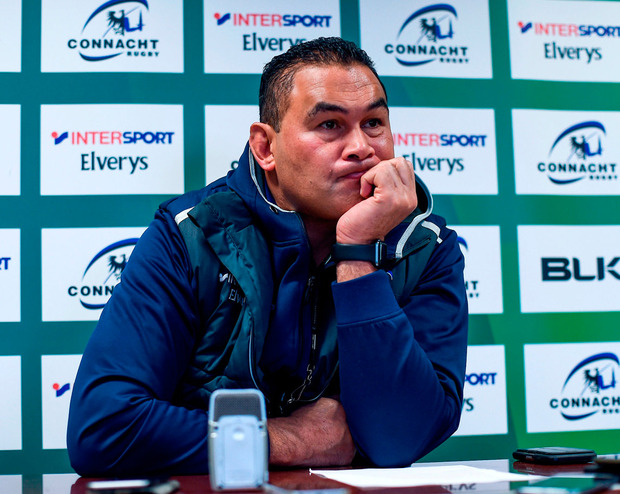 It must be quite a while since bookmakers were offering 14-point spreads against Connacht but such is the way Pat Lam's side's season is going. Injury-ravaged and nestled in the bottom half of the table, the champions travel to Swansea without their twin-talismans Bundee Aki and John Muldoon as well as the rested Kieran Marmion and while there are plenty of good players in the team, it seems unlikely they'll be able to get the desired result without them. They visit one of the more impenetrable venues the Pro12 has to offer to face an Ospreys side who are on a good run of six wins in seven games and sitting comfortably in second place. Connacht won at the Liberty Stadium last year, but the Welsh region, heavily affected by the World Cup, have grown in strength since and coach Steve Tandy has picked a strong side for the western province's visit. Tandy said: "Connacht are always combative up front and they play a good brand of rugby. They are very dangerous. "We know that we are in for another test so have to prepare thoroughly and will have to step up a level or two again. "The Pro12 breaks for a month after this weekend so it's important we make a statement, keep the momentum going, and ensure we are in a good place. We are in a good place and are up for the challenge." Lam's men find themselves 11 points behind sixth-placed Ulster and know that it would be dangerous to conceded any more ground with half of their fixtures remaining. Defending their title looks beyond them now, but the departing coach wants to part with European Champions Cup rugby secured. "We want to be in Champions Cup every year, that's the minimum goal," said Lam. "The play-offs this year, seven and eight gets into it. We don't want to go there, we want to be automatically qualified, that's the minimum. "The Pro12 has gotten stronger and stronger, and anyone can beat anyone on their day. There is a lot of rugby still to play and we will see where we are. "To me, there is no point in getting frustrated (about the amount of players we have available), it is all in the mindset." Jack Carty is fit enough to play alongside John Cooney, with Peter Robb partnering Rory Parata in the centre and first-choice back-three Tiernan O'Halloran, Niyi Adeolokun and Matt Healy all fit. Up front, they can rely on a strong front-row of Denis Buckley, Tom McCartney and Finlay Bealham, while Quinn Roux and James Cannon shouldn't be pushed around. Fiji international Naulia Dawai deputises for Muldoon, with Seán O'Brien - who spent time with Ireland this week - and Jake Heenan on the flanks. Eoin McKeon will win his 100th Connacht cap off the bench. Tandy has selected rising star Sam Davies at No 10, with Dan Biggar on a loaded bench that includes a full international front-row. It is the Welsh side's strength in depth that is likely to see them home this afternoon. "Ospreys have all their guys humming and playing well. Everyone is just trying to get points before we go to Champions Cup and they go to Challenge Cup, Lam said. "This is probably the last fixture they have before their players head off to Six Nations. So full strength, at home, they are trying to get maximum points. "I like the way they play rugby. They have got quality coaches there. But I knew they would come back strong, like Glasgow as well because they have got quality coaching. "Last year they put a lot of work in and they are reaping the rewards." With pivotal European pool games looming in the next fortnight, it's important that Lam's men defy the bookies. A losing bonus would do. OSPREYS - D Evans; D Howells, A Beck, J Matavesi, H Dirksen; S Davies, T Habberfield; N Smith, S Parry, M Fia; L Ashley, AW Jones (Capt); O Cracknell, J Tipuric, D Baker. Reps: S Baldwin, P James, R Jones, A Beard, S Underhill, B Leonard, D Biggar, K Fonotia. CONNACHT -- T O'Halloran; N Adeolokun, R Parata, P Robb, M Healy; J Carty, J Cooney; D Buckley, T McCartney, F Bealham; Q Roux, J Cannon; S O'Brien; J Heenan, N Dawai. Reps: D Heffernan, JP Cooney, J Andress, L Stevenson, E McKeon, C Blade, D Poolman, C Gaffney.